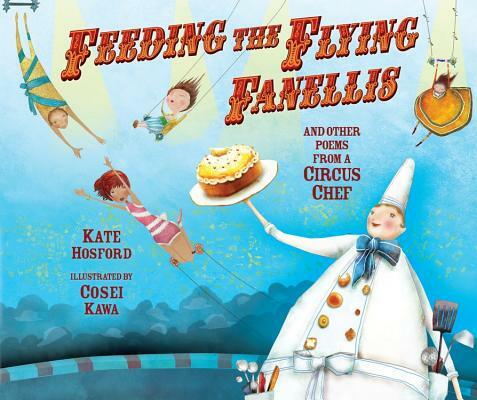 Kate Hosford’s book, Feeding the Flying Fanellis and Other Poems from a Circus Chef, illustrated by Cosei Kawa (Carolrhoda, 2015), is a complete delight. The concept of combining cooking with circus is genius. Both activities are popular with and appealing to kids, and food brings circus, which can feel exotic and other-worldly, down to earth for children. On top of that, the rhymes are varied, and the poetry is both fun and informative. The ringmaster’s meals are in his top hat! The juggler is growing thin because he juggles his food rather than eating it! Readers will empathize with a homesick strongman. 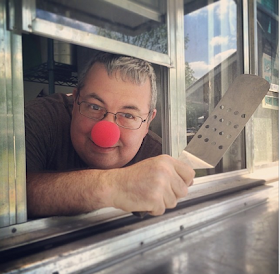 Why did you choose to write about a circus chef? As a former dancer and gymnast, I’ve always been intrigued by circus, but when I was growing up in Vermont there were not yet opportunities for teenagers to participate in circus arts. 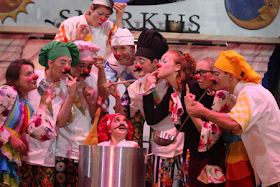 This changed while I was in college; in 1987, the Vermont-based Circus Smirkus, was founded, and in 1989, my father’s non-profit Project Harmony organized a youth exchange between Circus Smirkus and a circus from Tbilisi, Georgia. I later went on to see many more amazing performances by Circus Smirkus, as well as shows by the Big Apple Circus, and Cirque de Soleil. I am also a fan of contemporary circus productions such as those from the Montreal troupe Les 7 Doigts de la Main (the 7 Fingers of the Hand.) I saw their show Traces ten times in 2012! My interest in chefs probably resulted from the fact that I developed food intolerances in my thirties and had to live on a restricted diet. Food suddenly became a complicated part of my life, and I fantasized about having a personal chef who could cook for me, leaving me to free to focus on other things. When I was about thirty-five, I began to write picture books. My first attempt was a story about a chef with a morbid fear of onions, and my second was story about a rooftop circus. However, it took another eight years until I decided to combine these interests and write about a circus chef. Once I started researching actual circus chefs, I was hooked. There were stories about stilt walkers from Trinidad who covered all their food in ketchup, Russian performers who put mayonnaise on every dish, and if the shipments of animal food didn’t arrive, the chef would have to bake bread for elephants, and feed the tigers meat from their freezers. At first I thought maybe I should write a nonfiction book about circus chefs, but the desire to make up my own circus won out. I loved the idea of a chef who would have to cater to different kinds of performers with a variety of dietary and emotional needs. After trying to write about a circus chef in a picture book format, I eventually switched to poetry, and decided to write from the chef’s point of view. After that, the initial poems came quite quickly, but it took another four years to revise them. Can you talk about the editing process of the book? I first presented these poems as a workshop piece at Vermont College of Fine Arts, where I received my MFA in Writing for Children and Young Adults. 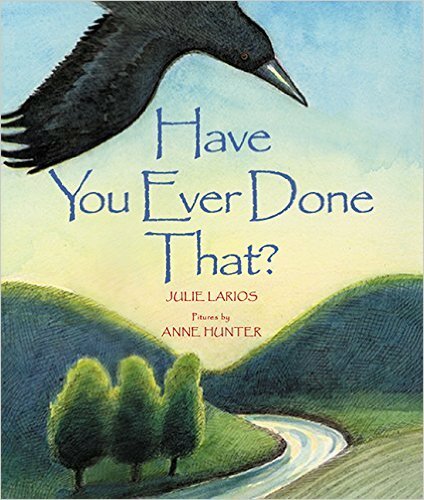 The feedback was positive, so I continued to work on the poems in my fourth semester with poet Julie Larios. I will always be grateful to Julie for holding me to a high standard, while also helping me tap in to my whimsical side. After Carolrhoda Books acquired the manuscript, I wanted to explore various poetic forms such as the triolet, pantoum and double dactyl. Editor Anna Cavallo was helpful and patient as I tried out countless versions of each poem. While these particular forms did not make it into the book, I did make sure that I had a collection with varied rhyme schemes and rhythmic patterns. It was also important to me that the poems were interwoven, so that a character introduced in one poem might make a cameo appearance in another poem. I guess this was my form of world-building. I also showed an earlier draft of the poems to Circus Smirkus founder Rob Mermin. At that time, the collection contained a poem about a clown who was a bad-mannered buffoon. 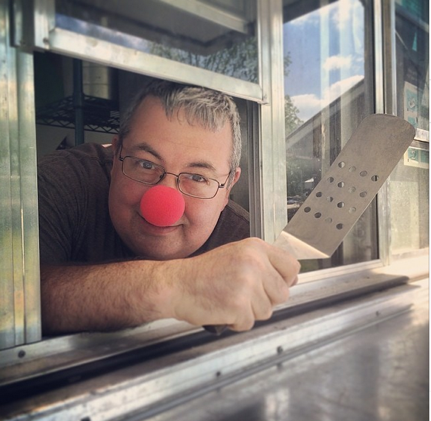 Rob encouraged me to create a poem about a refined clown, who more accurately reflected the ethos of circus clowning. I threw out my original clown poem and wrote a new poem about a sophisticated and well-mannered clown who is conflicted about having to throw pies. Aside from that change, the cast of characters mostly remained the same throughout the editing process. The only character who didn’t make the cut was a unicyclist who couldn’t stop long enough to eat. What do you love about Cosei Kawa’s illustrations? I love the fact that the pictures are complex and completely original. I haven’t come across another illustrator who has a style even remotely similar to Cosei’s. His take on the circus is surreal, and I think there is a lot there for children to discover upon repeated readings of the poems. I also love the fact that many of the images have depth to them, and his use of wacky perspectives complements the eccentric personalities of the performers. I am working on a couple more poetry collections, which also have interrelated poems. I have five or six picture books in process, and am beginning middle grade novel about ballet. I have now started ballet lessons, and have to stand in the middle of the class so that I always have someone to follow! I"m so excited about this book, what fun! The illustrations are truly a great pairing with your clever, whimsical poetry, Kate. I'm cheering for this latest venture, hooray! 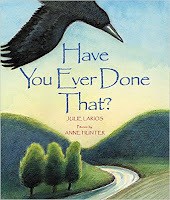 Love hearing how the book merged themes and concepts, and even how the poems evolved in time. The illustrations are beguiling as well. On my TBR list! Cynsations is a moderated space of information, inspiration and celebration. Please avoid spoilers and keep contributions--in content and tone--kid friendly. In addition to young adults, Cyn also writes for elementary audiences who regularly visit this blog. Writers, who make up the core audience, include tweens/teens, many of whom Cyn has taught in workshops (Cyn waves to them & sends virtual hugs!). Because the comments are moderated, they will not automatically appear. But we check in at least once a day. If you're worried, re-send and I'll pick whichever version is the most polished. If you are commenting as "anonymous," please sign your post. Thanks again!